Okay! Musume Time: A Coronation of Smiles! Houkago Princess Crown A New Class of Royalty! A Coronation of Smiles! Houkago Princess Crown A New Class of Royalty! On September 22nd, Houkago Princess took to the stage at Zepp Diver City in Tokyo, perform two one-man lives titled ~Twinkle~ (day performance) and ~Miracle~ (evening) respectively. It was during these very performances that Nagasawa Marina, Sekine Sasara and Kojima Mayumi held their coronation ceremony, the final step in crowning them as 'princesses' of the Regular Lineup for Houkago Princess. Throughout the ~Twinkle~ performance, members wore their seifuku uniform, as well as newly debuted sports costumes, whilst in the evening, the members transformed into their Idol and Princess costumes. It was close to the end of the ~Miracle~ performance that the three former Candidate members were crowned, and fully initiated into the Regular Lineup along with the senior members of Houkago Princess. 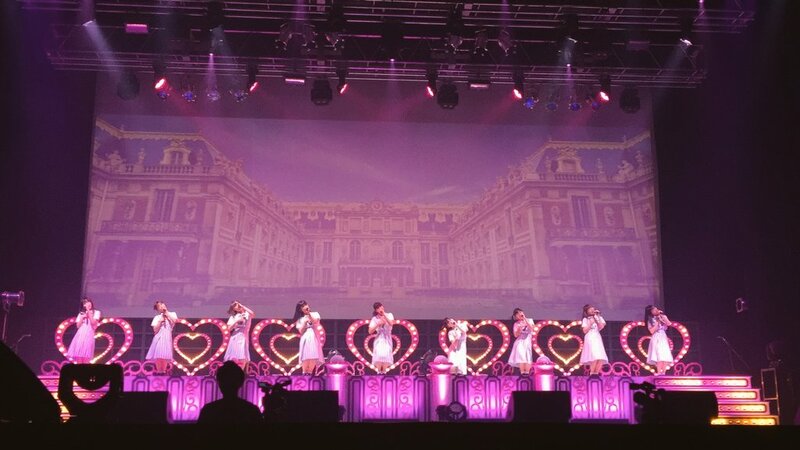 It was also during the ~Miracle~ performance that the four members of Houpriyusu, Nagasawa Marina, Sekine Sasara, Kojima Mayumi and Horii Nina held their final performance together, before the three latest members were crowned. It was a heartfelt moment for the three new princesses, who were taking their steps forward whilst leaving Horii Nina behind as the sole member of Houpriyusu. Throughout both performances, announcements in regards to the future activities of Houkago Princess were made as well, with the first being that the group would be split into two teams. The first, Team Twinkle, is made up of Odagiri Nana, Yamaguchi Miran, Kizuki Saori, Maika and Sekine Sasara, and will focus on the members' skills in live performances, and have them work harder in future lessons, where they will show their abilities and strengths on the stage. The second, Team Miracle, is made up of Sirosaki Himari, Michishige Saho, Nagasawa Marina, Kojima Mayumi and current Candidate, Horii Nina. This unit is made up of the members who need to work more on their skills, and the members will take on challenges such as being MC's, and more. For these teams, the members will take on Team-based activities during irregular performances, and of course, they will continue as a group of nine. There is, of course, the chance that in the future, members might switch teams depending on the quality of their skill, and how well they are doing. Furthermore, it was made known that Nagasawa Marina would hold her first official Birthday Live performance with Houkago Princess on October 11th, to celebrate her 21st year. 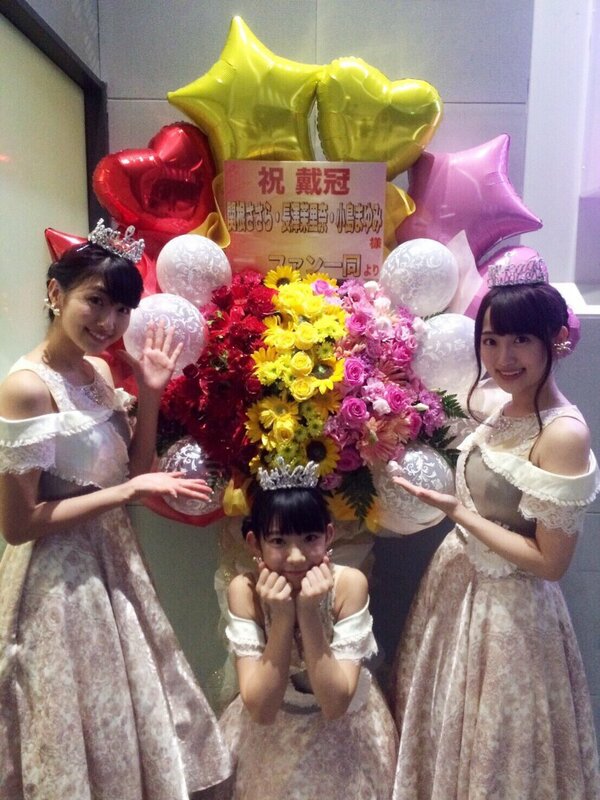 And, when the night almost came to its end, the three newest members of Houkago Princess held their coronation ceremony and were finally given their tiaras, taking their final step in becoming fully-fledged Regular members. All members gave their own speeches, with Nagasawa Marina thanking everyone for supporting her. "Since I was once dismissed from the group, becoming a regular member took me about 3 years since my joining (laughs). Although I've made all my fans worried, being to show them my coronation like, I thought that maybe I was able to thank the fans even a little." Kojima Mayumi, once given her crown, gave her own words on the promotion and its importance. "Because it was a surprise, I was flabbergasted. But, to be able to be promoted on the large stage that TIF is, which many people watched, it became a very important new page in my life." "Something happy happened in this song, I was able to be part a of the main vocal cast along with Miss Nana (Odagiri), and Miss Maika. To people who don't know HouPri, to deliver more of this song's view of the world, we will be working hard in the coming activities." And once the tiaras were bestowed, Leader Odagiri Nana read out a letter to the new members, congratulating them on their promotions and bringing hope for their futures together. "Endowed with the tiara, they will begin a new story, now as princesses. Let's also work hard together with the aim of becoming beautiful princesses. Congratulations!" And at the very end, after a few more songs, Houkago Princess brought an end to this chapter in their story as they performed together the groups hit song, Juliet ~Kimi wo Suki na 100 no Riyuu~, concluding their first one-man live at Zepp Diver City, as well as truly bringing the newest members into the heart of the group with their representative song.